Toyota says Kon’nichiwa to the Sports Car World! The last few years have seen a new trend in large-scale models. From the moment 1:18 scale models first took off some 40-odd years ago, most have been made of Zamac (for an alloy of Zinc, Aluminum, Magnesium, and Copper). More recently, however, the increase in cost associated with Zamac has led several manufacturers to shift to resin—with the focus instead placed on pinpoint accuracy of surface details, perfect dimensions and authentic colors. Among these new resin ranges, Kyosho’s Samurai Series—launched last year—stands out due to its subject matter. With releases in both 1:12 and 1:18 scale, it was decided that all Samurai models should depict historically important Japanese vehicles. 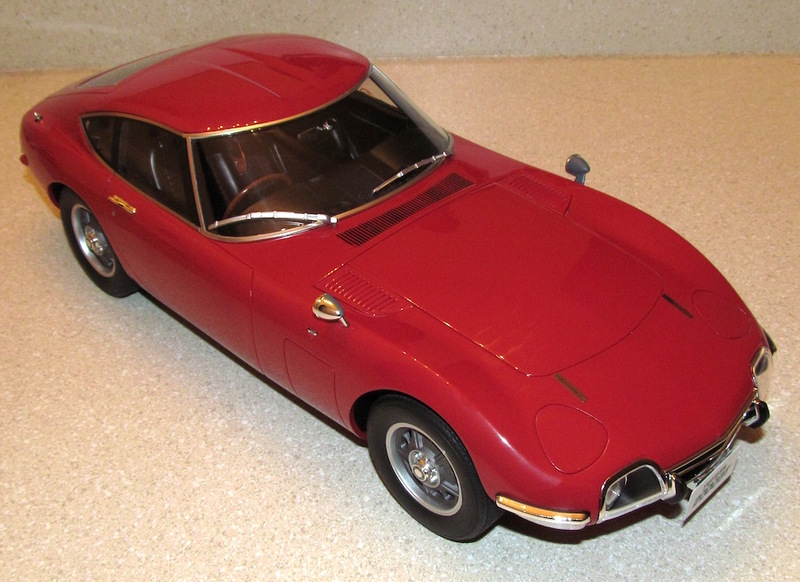 As such, the Toyota 2000GT was the perfect car to start with. Launched in 1966, the 2000GT was conceived as Toyota’s first halo sports car. Wanting to crack the US market, Toyota needed to make something to attract attention and show that while they weren’t yet well-known outside of Japan, they were an engineering force to be reckoned with who could build a sports car to compete with the likes of the E-Type Jaguar. Much of the 2000GT’s development was actually carried out by Yamaha. Riding on a backbone chassis, it was powered by the 2-liter inline six from the top-of-the-line Toyota Crown sedan, but with a new DOHC head and three double-barrel Solex carbs. The swoopy 2-door coupe styling by Satoru Nozaki incorporated pop-up headlamps as well as large driving lights and featured uniquely separate opening panels in the front fenders to access the air filter and battery. Toyota set about promoting the 2000GT heavily, entering it in the 1966 Japanese Grand Prix and winning the Fuji 24-Hour Race in 1967. It also set several FIA records for speed and endurance, and three cars were raced in 1968 SCCA production car classes by Carroll Shelby. Elsewhere, a special 2000GT roadster was created for the 1967 James Bond film You Only Live Twice, and British model-of-the-moment Twiggy was hired to pose with the coupe at the 1967 Tokyo motor show. Toyota gave her the gold 2000GT she had been photographed with as part payment, hoping she would be seen driving it. Twiggy, however, didn’t have a license and put the car in storage. Undaunted, they bought it back and tried to turn it into a TV star by giving it to the ABC network to use in the (unsuccessful) 1968-9 sitcom The Ugliest Girl in Town. 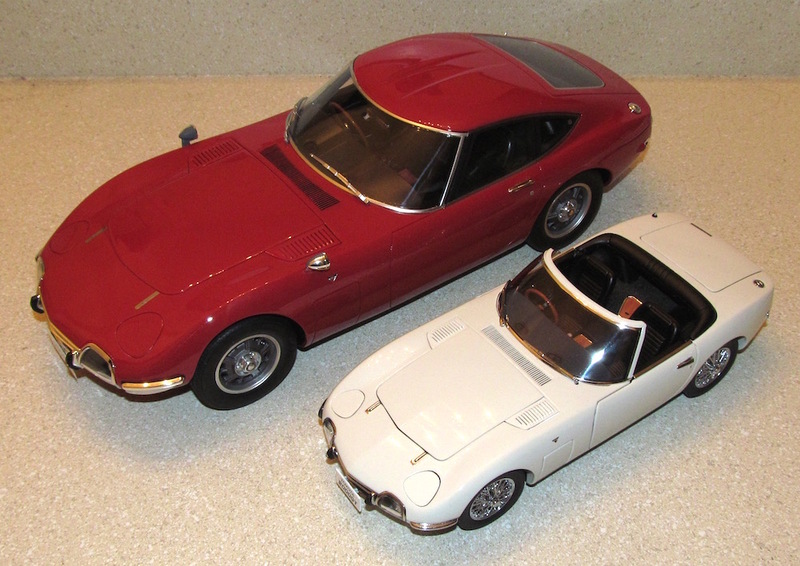 The publicity push worked as both Toyota’s and the 2000GT’s profile rose. But by the turn of the decade, the car had served its purpose. Toyota was now well established on the global market and its new mass-market sports coupe, the Celica, was on the scene. 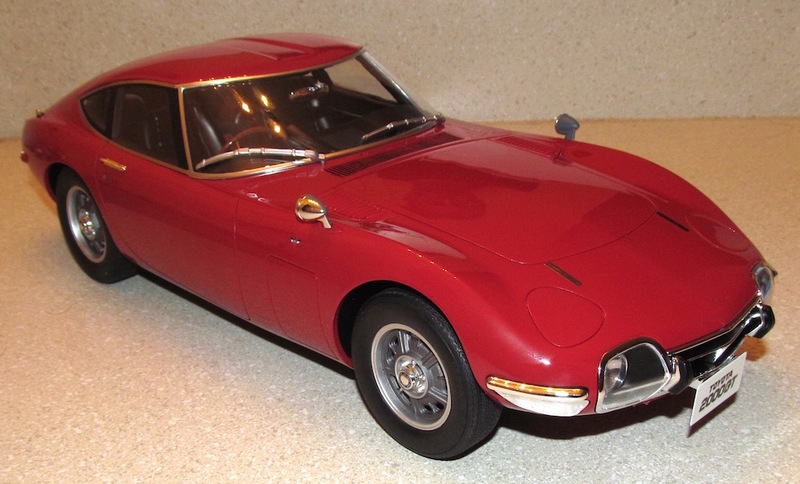 The 2000GT was virtually hand-made and in spite of its then-colossal $7,230 selling price ($2,000 more than an E-Type), Toyota lost money on every car. In 1969, the 2000GT had been mildly restyled with smaller driving lamps, reversed front indicators and larger rear ones. Further styling studies were produced with the pop-up headlamps replaced by fixed units to cut costs, but these weren’t a success and were abandoned. A final series of just nine cars were produced with air conditioning, an optional automatic transmission and a larger SOHC 2.3-liter engine, with the last of these coming off the production line in 1970. 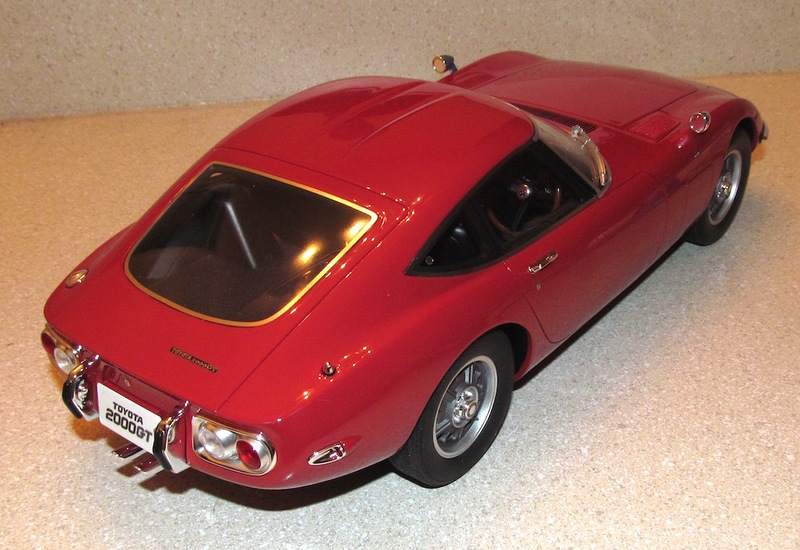 Hundreds of models of the 2000GT have been made since 1966, but Kyosho’s may well be the finest. Produced in a limited edition of 1,000 (300 in red, 700 in white), Kyosho used the resin-cast process and 3D CAD data to scale the car down as precisely as possible without making any of the usual adjustments to spaces, curves and sizing that take place when a car is scaled down for modeling. The paint is particularly deep and lustrous and the car’s distinctive alloy wheels have also been captured to perfection. An iconic model of an iconic car, the Samurai 2000GT sets the standard for the rest of the range.